A NOTE: The Michigan Campaign Finance Network helped compile the data that a group of Michigan State University journalism students used to track the influence of political action committees (PACs) in Lansing. You can read their full reports here: http://news.jrn.msu.edu/series/capital-expenditure. A new story will be published each day this week on the page. LANSING – A majority of the campaign money accepted by Michigan lawmakers in 2017 didn’t come from their individual constituents. Instead, it came from political action committees, which interest groups use to raise dollars to influence elections and public policy. 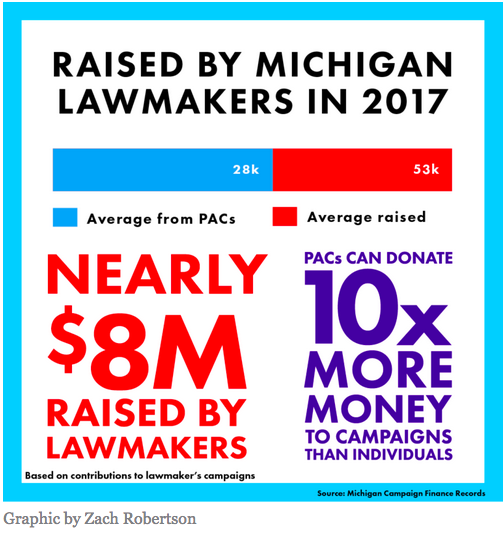 Contributions from the committees – called PACs – accounted for 54 percent of the total amount of money accepted by lawmakers’ campaigns in 2017, according to a Spartan Newsroom analysis of Michigan campaign finance records. “That is pretty high,” said Denise Roth Barber, the managing director at the National Institute on Money in State Politics, a group that tracks money in state politics across the nation. Even though 2017 was a non-election year, Michigan lawmakers raised nearly $8 million from all sources – individuals, parties, political action committees – to help them eventually run for re-election. PACs are operated by diverse organizations seeking to influence public policy. Their contributions accounted for 54 percent of the total amount accepted by lawmakers in 2017, according to the analysis. — Seven lawmakers invested more than $10,000 in their own campaigns. Rep. Holly Hughes, R-Muskegon, was the largest self-funder with $250,000. — On average, female lawmakers raised more than their male counterparts, despite raising a smaller portion of their funds from PACs. — The Republicans raised more money from both PACs and individuals overall, but Democrats rely on PACs to a greater degree. Democrats got 61 percent of their campaign funds from PACs, compared to 50 percent for Republicans. — Several lawmakers raised substantially smaller sums of money than their colleagues who often raise 50 times more. — Even in a non-election year, lawmakers raised a significant amount of campaign funds for what they say are spiraling costs of running for office, including social media targeting and physical mailers. 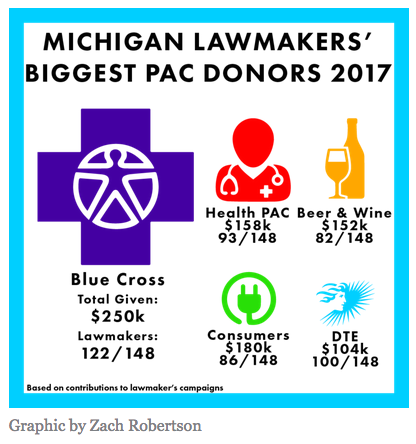 Some of the largest PAC contributors in 2017 were Blue Cross Blue Shield of Michigan ($250,000), Consumers Energy ($180,000), Michigan Health and Hospital Association ($158,000), Michigan Beer & Wine Wholesalers Association ($152,000) and DTE Energy Co. ($104,000). State lawmakers on average raised more than $53,000 each from all sources, according to the analysis. They took on average more than $28,000 each from the PACs. The PAC money from special interests threatens democracy, said Lonnie Scott, the executive director of the progressive government watchdog group Progress Michigan. As an example, he cited contributions from the politically powerful DeVos family of Grand Rapids. Betsy DeVos was tapped by President Donald Trump as Secretary of Education. “These numbers are not surprising when you consider all the steps Republicans have taken over the last few years to increase the power of private money in our democracy,” Scott said. In 2013, the GOP-controlled Legislature voted to double campaign contribution limits in Michigan. The change allowed a PAC to give up to $20,000 to a candidate for the state Senate and up to $10,000 to a candidate for the state House. The previous limit for a Senate candidate was $10,000 and for a House candidate was $5,000. But PACs are not a partisan issue. The Spartan Newsroom analysis found that Democratic state lawmakers in Michigan took 61 percent of their funds from PACs in 2017. The Republicans took about half their contributions from PACs, although they raised more PAC money (31,000 to 24,000) in total. Others insist that PACs are not necessarily a bad thing. “They are usually representative of a group of the population that has an issue that is important to them,” said Randy Richardville, a former Republican lawmaker from Monroe who is the former Senate majority leader. “The reason that they exist is they pool people’s voices together to have a louder voice regarding a certain issue. And the nearly $8 million raised by lawmakers in 2017 is not as big as it seems, he said. Groups concerned about the influence of special interests in campaigns say that tracking the amount of money raised from individuals and PACs is incredibly important. “If money can influence elected officials, then those with the most cash hold a lot of power,” Scott said. In Michigan, like in many states, PACs can donate 10 times the amount an individual can. The way to break the cycle of political power going to those who have the most cash is by increasing participation in elections, Scott said. “We need to make voting more accessible to everyone regardless of where they live or when they work and create a culture that inspires people to participate,” he said. Tomorrow: Seven Michigan lawmakers donated more than $10,000 to their own campaigns in 2017. NOTE: This story is one of a series produced by a Spartan Newsroom campaign finance data analysis project. Andrew Birkle, Natalie Dymkowski, Jaylyn Galloway, Ian Hawley, Eli Pales, Zach Robertson and William Thiede contributed to the series. It was produced with the advice and collaboration of the Michigan Campaign Finance Network.